I despise hipsters as much as the next person, but these Disney Princess Hipsters are absolutely hilarious. None of the Disney Princesses are safe when it comes to Internet memes. Aurora, Ariel, Belle, and all the rest can be seen expressing their hipster views after the jump with a guest appearance by Iago! TeeHee: Could Disney Be Up To Their Old Tricks? Now that Disney has recently released their 50th animated feature film, it appears they might be back to their roots in more ways than one. The House of Mouse has been notoriously known to put hidden sexual messages inside their films; although they will tell you differently. 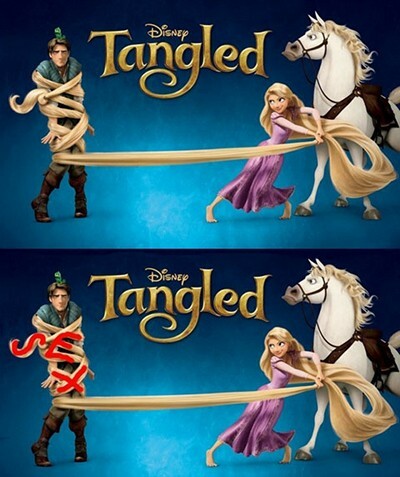 But it looks like not even Tangled could escape from their sinister clutches. See some more instances of their accused sexual exploits that they have put in past movies after the break. Lacking the opportunity to gain screeners or press screenings makes it slightly more difficult to fit in the time or budget to see every movie that comes out within a year. Sometimes you just have to buck up and watch a lot of damn movies; that’s what the Internet is for. With less than one week until the 83rd Annual Academy Awards, I felt that it is my duty to share with you my thoughts on last years motion pictures. The year was 2010 and a whole lot of nothing was going on in the cinema world; there were the really good and then there were the really bad. Hardly any movies in 2010 were sub-par, but to create a list of the best was really hard to determine. So what films did I love and what films did I hate? Find out after the break to see who made my best and worst movie lists of 2010! The 68th Annual Golden Globe Awards will premier live tonight on NBC from 8:00-11:00 p.m. (EST) from the Beverly Hilton Hotel hosted again by Ricky Gervais. If you are unfortunate for some reason to not have TV, I’ll update you on the events and the winners and give you my opinion if that is anything of value. Catch the live updates when the Globes go live later after the break!